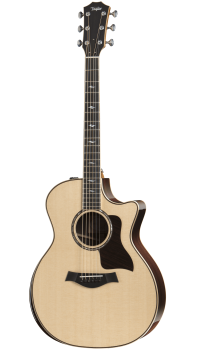 The new 800 Deluxe Series features all the voicing enhancements and aesthetic refinements of Taylor’s standard rosewood/spruce 800 Series, with three upgraded features: a newly designed radius-style armrest in maple with rosewood top edge trim, Adirondack spruce bracing, and chrome Gotoh tuners. Initially the series will be limited to three models. All come with Taylor Expression System® 2 electronics and ship in a Taylor deluxe hardshell case.